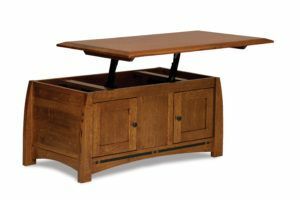 Brandenberry Amish Furniture has earned a reputation for mixing tradition with innovation, and the Boulder Creek Lift Top Coffee Table is a prime example. It’s a beautifully crafted item of living room furniture that’s rooted in the Mission tradition. But the Boulder Creek line adds distinctly modern design accents. So what makes this line of furniture and the Boulder Creek Coffee Table with Lift Top so appealing? Three top reasons come to mind. First, designers base the Boulder Creek line on the classic Mission style popularized in American furniture in the early 20th century. However, the designers added gently curved legs, ebony inlays and arched skirts. And with that, they created the Boulder Creek Collection. So furniture enthusiasts will agree that this contemporary look adds a touch of warmth and classic style to any living room or den. Second, a variety of custom options allow customers to create the coffee table to their liking. For example, customers can choose the wood species. And these include oak, maple, cherry and hickory. Also fine furniture enthusiasts can select the stain or finish and hardware. Plus other choices. Third, the lift-top mechanism allows the coffee table to function as a dining table/work and play station rolled into one. Just raise the 1-inch-thick, solid wood top. Then, pull it forward. And the lift top is ready to be used as a snack table or platform for your favorite device. But lots of cool features lie below the lift top. For starters, the builders carved out a 3 1/4 inch storage area below. And it’s great for living room accouterments like remotes and magazines. Also, customers will find lots more storage space — and an adjustable shelf — behind the doors. Finally, customers can complement the Boulder Creek Lift Top Coffee Table with other pieces of occasional furniture in the Boulder Creek Collection. And these pieces include end tables and sofa tables. Also, the Boulder Creek Collection includes media stands and cabinets, bookcases and home office furniture.